If you’re taking your dog on holiday with you soon, here are some simple tips that will make travelling with dogs easy! This guest post is by Josh from Kyra Pets, a blog full of information to help keep your dog healthy and happy. Travelling can be really stressful, let alone travelling with your dog. But, it doesn’t have to be that way. This article will give you plenty of easy, actionable tips for a successful and stress-free trip with your dog. For a successful trip, you’re going to want to plan everything ahead of time to avoid any unexpected situations. Go online and search for pet-friendly accommodation + (Phoenix, Arizona), or wherever you’re staying. Just because a hotel is listed as “pet-friendly”, doesn’t mean it’s a good fit for your dog. Read their pet policies and check their surrounding areas for any pet-friendly restaurants or parks. And make sure to read reviews by previous guests, watch videos and, if possible, schedule a time to talk with the staff. Before packing up your things, take Fido to the vet for a health check, and make sure his vaccinations are up-to-date by taking shot records with you. If you’re flying, airlines will require health certifications for your dog. So check their policies, make a list of what they require and take it to your vet. Motion sickness can appear out of the blue, even if your doggie has never experienced it before, and it can happen in all sorts of vehicles. So be sure to ask your vet for anti-nausea pills, especially when going for a long journey. Is this the first time you’re travelling with your dog? Or maybe he’s been travelling before? If the previous time you travelled with your dog was havoc, don’t worry: the first time is usually the worst. But if this is your dog’s first trip , you’ll want to pay special attention to this section. Take your dog for a “test drive” to see how he’ll react and to prepare him for the real thing. Drive with him for about 1-2 hours and make sure to stop at fun places, like a dog park, for example. And help your dog associate the ride with positive things by giving him a nice chew toy. This will help make your actual trip stress-free. Don’t forget to bring a supply of your dog’s regular food as well as water bowls. Work out how many days your trip is going to be and bring along enough food. In fact, it’s a good idea to bring along a little extra, in case of emergencies. You don’t want to have to buy a different kind of food just to find out later your dog’s got an upset stomach. A first aid kit can be a real lifesaver, so buy a good first aid kit if you’re travelling overseas or heading off-road. And if you’re on the road, the best first aid kit can be a phone app that shows you where the nearest 24-hour vet hospital is. That can come in very handy because your pooch will be in the hands of a pro. Also, be sure to get the phone number of the nearest vet hospital of where you’re staying, and take along the phone number of your dog’s regular vet. Sometimes vets might need to get in touch with each other to share some crucial information about your four-legged friend. 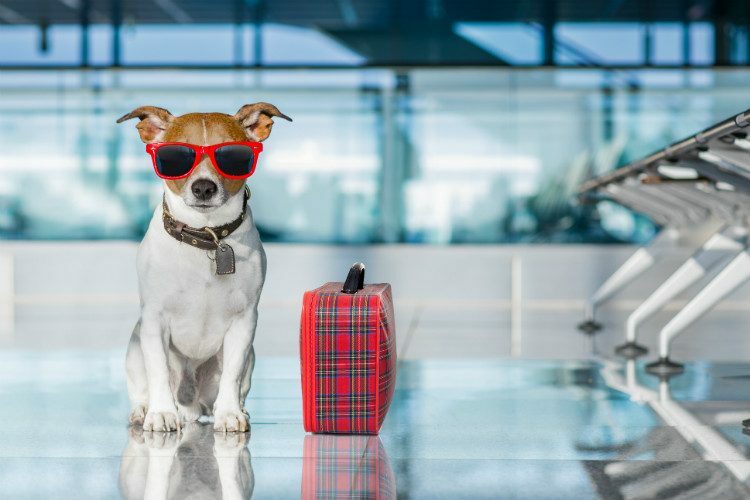 Dogs are like children; the key to a successful and calm trip is to distract them and keep them entertained during travel, says Dr. Patty Khuly from VetStreet. For that reason, you should bring his favorite old toys, and add in a couple of new ones to avoid boredom. Dogs are creatures of habits and bringing along his favorite blanket and toys will help to get him settled in a new environment and reduce his anxiety. Do you think you’re going to need 5 chew toys per day to keep your dog entertained at the hotel? Then, bring 10. Bringing a good supply of chew toys will reduce your dog’s anxiety and fight boredom. Plus, it will mentally stimulate him and keep him from damaging the furniture. You don’t want to pay for damaged hotel furniture, do you? So, it’s the big day! You’ve gone through all the previous steps, checked off every item on your pet travel checklist, and took your dog on a “test drive”. Wait! 30 minutes before the journey, take your dog for a long walk and play a good game of fetch. Exercise will make your dog tired so he won’t have much energy during the ride. And, as they say: A tired dog is a happy dog. Take him to the vet for a pre-travel health check. Get the vet’s phone number, along with the phone number of the nearest 24-hour vet hospital of where you’re staying. Take his favorite toys with you along with his blanket and bed. Take anti-nausea pills just in case your dog gets motion sickness. Research pet-friendly accommodations and get feedback from previous guests. Don’t forget his regular food and water bowl. If you carefully follow the tips in this article, you will have a safe and fun journey with your dog. And iff an emergency does happen, you will be fully prepared. Have you ever travelled with your dog before? What was it like? Or, if this is your first time, what are your expectations?